This fall, two contemporary works will explore the dialogue between dance and music. First, the North American premiere of Une idée sinon vraie... will take place from October 24 to 26 at Agora de la danse. Using Ana Sokolović’s work in seven movements and three interludes, the Commedia dell’arte I and II, the Bozzini Quartet and dancer and choreographer Marc Boivin will take to the stage and dramatically expose the hidden facets of our personalities and their contradictions. 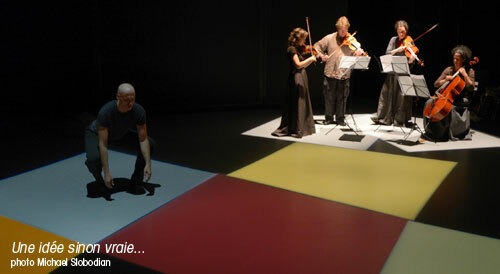 Second, from November 14 to 16, the show Vertiges will also be performed at Agora de la danse. Choreographer and dancer Paul André Fortier says, “My projects are first tied to people I find stimulating and inspiring and Malcolm Goldstein is one of these people.” The two middle-aged men explore pain, loss and especially sadness. “There are negative sadnesses, but there are others that maturity has us accept. This is the type of sadness in question,” he explains. “Him and I are starting to ask ourselves what comes next. There is less left ahead of us and we are getting closer to the horizon. Hence the vertigo, the space behind us looming larger,” furthers Fortier. “Throughout the one-hour duration of the piece, some moments are very intense and moving, whereas others are crazy.” The choreographer opted for the utmost simplicity. “It’s a search for authenticity and honesty—for the audience, it’s interesting.” A large part is dedicated to musical improvisation towards the end of the dance. Pas de deux? Dialogue? It’s not a question of following or leading the other. “In the process of interplay we become as one,” outlines Malcolm Goldstein. “Improvisation is an integral part of my music, both as a composer and as a violinist.” Goldstein summarizes his reasoning: “For me, improvisation is a process of discovery, the activity of sounding and allowing whatever is needed to come forth, an intensification of the moment. It is not a question of trying to express anything, as there are no intentions of mine other than to be totally present, focused and alive in each passing moment.” Fortier agrees, maintaining that “it’s not a question of demonstrating what we know but rather of showing the sum of who we are and of combining the two.” Spectators will be touched by the complicity of the two artists and by their emotionally dizzying encounter.